One of two adjacent town houses see ref 1752792 for our other property. 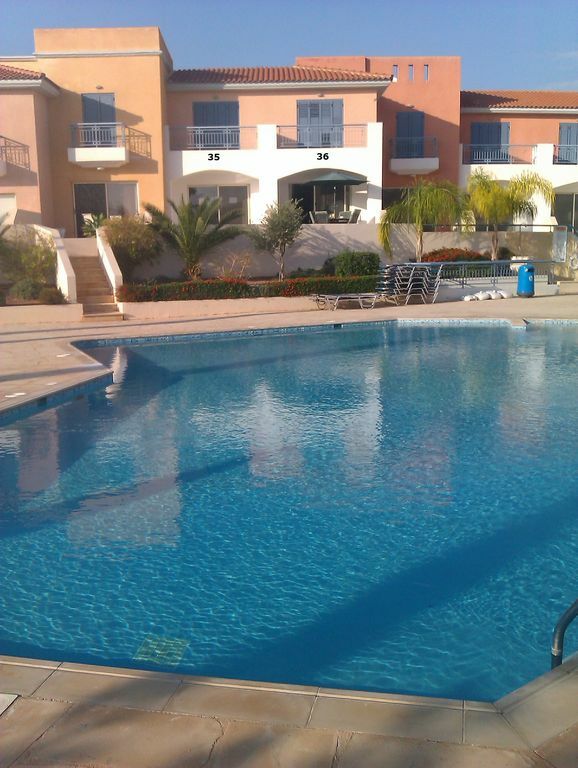 The development has a choice of 3 pools and offers mountain views to the north and distant sea views to the south and is just a 5 minute stroll to the heart of the village which has 1 restaurant and a wine bar. This holiday home is equipped to a very high standard with 2 bedrooms (both en suite) and a downstairs shower room with WC and hand basin. Fly screens, air conditioning/heating and ceiling fans throughout, part covered south facing patio with table and chairs, parasol and BBQ. Balcony off main bedroom. 4mgb wifi internet access along with TV package which has all terrestrial UK channels along with some sports and movies is provided FREE OF CHARGE for your entertainment. The lounge area has 2 luxurious fabric settees (one is a double bed settee) and quality cherry wood furniture – TV/display unit, 2 coffee tables, 32” HD TV and modem for wifi internet access. The dining area has a matching cherry wood/glass table and 6 chairs. In the kitchen there are plenty of units with granite work tops , top brand washing machine, fridge/freezer, cooker, touch sensor halogen hob, microwave, kettle and toaster. A wide variety of quality ceramics, glasses, cutlery and utensils ensuring that if you dine at home you have everything you need. Also available is an airer, ironing board and iron. Marble staircase leads to 2 bedrooms. The master bedroom has a double bed with bedside tables and reading lamps, fitted wardrobes with safe, dressing table with mirror and hairdryer. The en suite bathroom has a bath with shower over, folding solid bath screen, WC , hand basin and shaver socket. Across the landing is a double room with twin beds and bedside table, fitted wardrobes, dressing table with mirror and hair dryer. The en suite shower room has enclosed shower cubicle, WC, hand basin and shaver socket. Both bedrooms are supplied with cotton towels and linen and spares of everything should they be required. The property has a designated parking place. Two settees one of which is a bed settee. Two coffee tables, TV and sideboard. Fully equipped and furnished kitchen with granite work surfaces.Washing machine. We didn't have a car, but were kindly met by Ann and Stuart, who picked us up from the airport (a very short ride) and stopped at the supermarket to allow us to stock up with provisions (the local shop really only supplied the MOST basic of items.) The house was exactly as described, but even better was the fact that the pool is literally down a few steps from the outside area, thereby giving a feeling of being in your own private pool. The interior was extremely clean and very well equipped. Although there were other people close by, it was quiet and very tranquil. The village has 3 various eateries, from which you can leisurely walk back, within a well lit area. The bus route from the village, was reliable and cheap (timetables available) although the last bus back is at 4pm; however, taxis are readily available. All in all, we had a smashing relaxing week in the comfort of 'our own home' plus the sun! Thank you for your positive review I'm glad you enjoyed your stay. A most attractive house and location with everything we needed for a relaxing holiday. We had been to this, and the surrounding, area before and thoroughly enjoyed our stay on this occasion. The house was very clean, pleasantly furnished with everything you need. We made good use of the pool and the sun loungers. For most of the time we were the only people at the poolside. Not wanting to eat out every night, we also made very good use of the barbecue supplied, although there are very good restaurants in the area. Ticked all the boxes for us and looking forward to going back. Thank you Lynda and Neil and Ann and Stewart. Thank you for your review we are glad you enjoyed your stay. We come over to Cyprus often and we enjoyed our stay in this Villa. It is really very nice, clean, very comfortable and well maintained. The kitchen is well equiped with all mod cons, dishwasher, washing machine, microwave oven, cooker, etc. The BBQ outside was there if we needed it but this time it was only my husband and I. The TV has a good range of channels and the internet is fast enough to use e-mail and social networks. We would most definately recommend the Villa to our friends and use it again in the future. After all it was great value for money. My elderly mother and I stayed at Neil & Lynda's lovely home in Anarita for 12 days in early October - what a beautiful property and so reasonable in price. We both had our own bedrooms and our own bathrooms (power showers - absolute heaven), the property is furnished beautifully with everything you could possibly need & is very clean and neat too. Although we didn't watch TV, it is there for you via internet streaming. The pool is a few steps away with sun-loungers for your use. That too was very neat and clean. We were generally the only people at the pool most of the time we were there - which was very nice. The development appeared to be quite quiet at this time of the year. The days were still very hot, but were cool at night, so, other than occasionally having the ceiling fan in the bedroom on, we had no need for air con. We were collected from the airport by Ann & Stewart which was really great as I didn't want to drive at night in a strange place, and they were also very helpful in taking us to collect a hire-car a few days later. We had a welcome pack arranged as we wouldn't be able to get to the grocery store for a couple of days and that served us well. The entrance to Anarita is very pretty and is approximately 10 km's from Paphos, so, with a car, it's a very easy and quick trip into Paphos for sightseeing or shopping. I thought Anarita is a perfect location if you don't want to be right in the thick of things because the motorway is right there if you want to go off to Limassol or Kourion - which I did one day - what bliss it is to travel a motorway with no traffic! There is a grocery store just the other side of the motorway which had everything we needed for our stay so we didn't feel the need to find the big store in Paphos. We were on a budget & self-catering, but, on our last night, we decided to spoil ourselves & try Olivio's in Anarita ... there is no better word that can describe our food, but YUMMY!!!! Do go there - the food is amazing, the hostess is so generous (offered us a free brandy & liqueur after dinner - which I couldn't take advantage of as I had a plane to catch!) and the food just speaks for itself. All in all - we had a lovely, lovely holiday in a lovely home and I'd like to thank Neil & Lynda for accommodating my mother & I, and also Ann & Stewart for being so helpful too. I hope to come back again one day. Thank you for your glowing review. We look forward to your return in the future. stayed at property in august 17.
almost everything you require is onsite, all furniture is good quality for a relaxing stay after a long day out or after relaxing around the pool. theirs a good supermarket on the B6 down the road for all your supplies and essentials. didn't use any village restaurants as we have been coming to Cyprus for 30years and use other places like Konia which is a village 10 mins down the end of A6 at Paphos. the only minor faults with property which we overcome was the lack of no clean linen for beds so you had to strip and launder beds before going out and the lack of privacy on veranda as there is no screened off area from neighbours so they can see what your doing and eating all the time on the right hand side so most times we ate at dining table inside. we would still recommend property as we had a great holiday and you don't come away to sit in doors all day. the village is very quiet and relaxing and is close to motorway for ease of exploring this wonderful island. the village down the road (Mandria) has some good restaurants for traditional food especially the taverna opposite Mandria fish and chips which is also great if you want cod and chips just like home. our friends who travelled with us to Cyprus had wonder first ever visit to Cyprus and would also recommend this area to stay in as like us we prefer not to stay at hotels any longer than a week, we like staying away from the tourist areas and the chaos that goes with it. Thank you to Lynda and Neil for sharing there wonderful property with us and suppling all the information we required at property. Thank you for your kind review. The privacy issue is on our list of jobs when we get a lull in bookings. Very happy experience for the whole family. The property is as advertised, very nice, very well maintained, quiet, with lovely neighbours and supported very well by the management team Anne and Stuart. Because of its rural setting a car is highly recommended, although you can manage with a bit of organisation by using the bus service from Anarita. For each additional guest over 4 add £35 pppw. Key safe and Wi-Fi codes will be given prior to arrival.